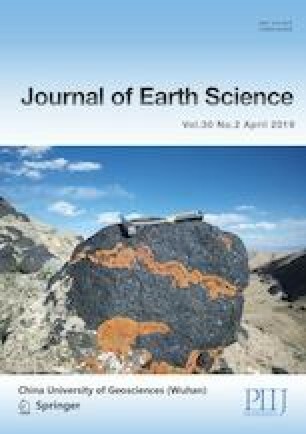 A comprehensive geophysical profile stretching from Qingyijing at the southern edge of the Junggar Basin to Ubara on the northern margin of the Junggar Basin was conducted in an attempt to probe the crustal structure of the western Junggar Basin (hereafter referred to simply as ‘the Basin’), and, in particular, the structure and property of the Basin’s crystalline basement. A survey using seismically converted waves was conducted along this profile to determine the characteristics of the P- and S-wave velocities typical of the crust and uppermost mantle. A joint inversion of gravitation and aeromagnetic data was also performed to acquire the density and magnetization intensity values found beneath the western Basin. This research revealed that the Basin is composed of the so-called Manasi terrain in the south, and the Wulungu terrain in the north. Their boundary is located along the WNW-trending Dishuiquan-Sangequan suture, linking the NE-striking Da’erbute suture (DS) in the west, and the WNW-trending Kalameili suture (KS) in the east. In its northern part, the Wulungu-type terrain has a double-layered basement, of which the upper layer is a folded basement of Hercynian orogenic origin, and the lower layer is a crystalline basement of Middle-Upper Proterozoic age. The southern part of the Basin, i.e., the Manasi terrain, has a single-layered crystalline basement. The folded basement here is too thin to be clearly distinguished. This research was supported by the Major Program of the National Natural Science Foundation of China (No. 41490611), the Joint Research Projects between the Pakistan Science Foundation and the National Natural Science Foundation of China (No. 41661144026), and the Detailed Lithospheric Structure and Deep Processes of the Tibetan Main Collision Zone (No. 2016YFC0600301). We should also like to thank Dr. Guoqing Zhang for the gravitational and geomagnetic data. The final publication is available at Springer via https://doi.org/10.1007/s12583-018-1207-4.